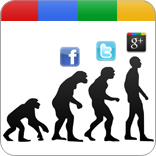 We’ll let others discuss Facebook; today we want to look at Google+. The biggest and most significant change is that Google+ is now open to everyone. No more invitations to join, no more being shut out from circles, no more wondering why your Facebook friends seem to have disappeared. Now everyone can play on Google+. You can use the “On Air” feature, which has widened the circle of participants. Be careful what you say though, as users also have the option to record sessions. You can also share Google Docs on Hangout, which is a slightly scary proposition for service providers but is, one presumes, good news for consumers. You can now indulge in a spot of screensharing. There is a sketchpad so you can create and collaborate and share in real-time. Kaila Strong mentions an advantage that extends beyond marketing applications (presentations) – users can now play games with their buddies or family. Bring on trans-border Pictionary. There is also Hangouts API. Huddle is no longer called Huddle. It’s now called Messenger, which swings dangerously close to MSN, doesn’t it? According to Jon Mitchell, advertisers ought to be happy with the fact that the +1 button will now appear on Google Display Network ads; which also has implications for Google’s revenue stream. Articles zipping across the virtual highway have opined that Facebook’s changes will drive many users to Google+ and vice versa. The only thing we know for sure is that the changes are coming too thick and fast for anyone to really keep up. The race is very definitely hotting up.